According to Tibetan ancient myth, the Tibetan people attribute their existence to the union of a Raksasi and a monkey. 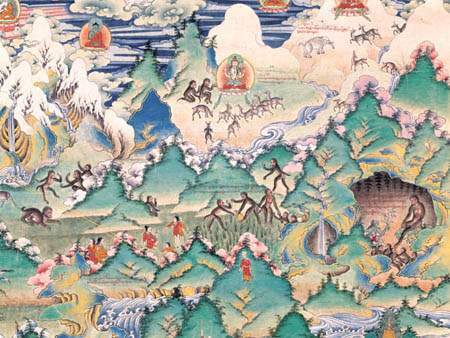 It was said that Tibetan history starts with a monkey and a Raksasi, an ogress, when the monkey was sent by Avalokiteshvara (Chenrezi), the Mother Buddha, for the religious cultivation on this high plateau. Later, the monkey asked Avalokiteshvara, she answered him that the marriage was a destiny and a good deed for Tibet. So eventually having the permission of Avalokiteshvara, they married and had five offspring who are believed to be the ancestors of the Tibetan people. The story that monkey became human was popular with the Tibetan people and was recorded in the ancient scriptures. You can also find the clues of the story in many wall paintings. Even Tsetang Town of Shannan Region in Tibet was named after the story (Tsetang means in Tibetan language the play place for monkeys). This story also coincides what old Charles Darwin said - that we've evolved from monkeys. 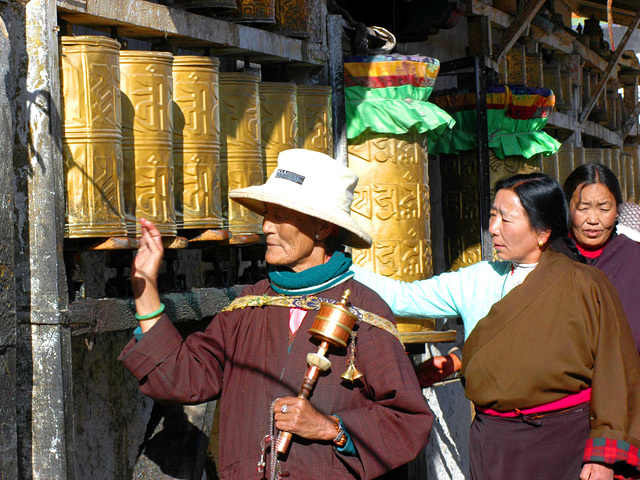 According to archeology, Tibetan history can be traced back 4,000 years. Archeological and geological discoveries lead ethnologists to believe that Tibetans are descendants of aboriginal and nomadic Qiang tribes. At that time, life was simple. The nomads foraged and hunted, often riding horses to travel long distances and using stone implements. Historical records show that not until the 7th century could Tibetans be recognized as a distinct race of people. 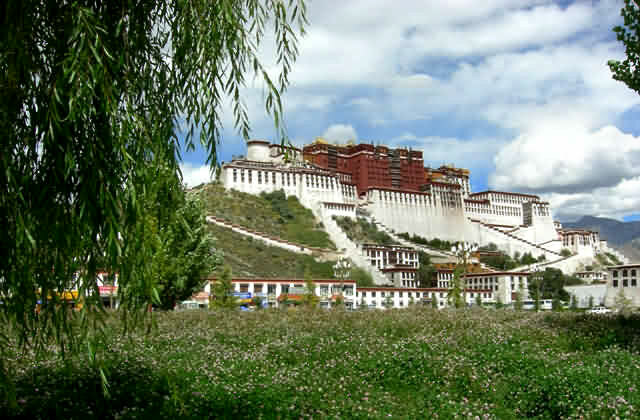 The first palace in Tibet, Yumbu Lakang, was built for the first king of Tibet, Nyatri Tsenpo. His offspring, Songtsen Gampo, the powerful and intelligent king of Tubo Kindom, conquered other tribes and founded the first dynasty of Tibet, the seventh century Yarlung Dynasty. It was at that time that a unified Tibet first emerged. Gampo also made great contributions to Tibetan culture, economy, technology, and religion by linking Tibet with the outside world to establish communication and trade. This impressive ruler married two famous princesses, one from Nepal and one Tang (618-907). The Princesses brought with them advanced technology, exotic culture, tea, silk, and most importantly peace and Buddhism. Gampo embraced the religion and the first traces of Buddhism, which would later dominate the region, entered the snowy land. The king and princesses built Jokhang Temple and Ramoche Temple to enshrine the holy statues of Sakyamuni. They also ordered the construction of the grand Potala Palace. The king's successors also became devout followers of the religion and in 779 King Trisong Detsen set up Samye Monastery, the first Buddhist temple in Tibet. The great religious teacher, Padmasambhava was invited to Tibet and Buddhism was recognized as the state religion. Buddhism was dealt a temporary blow, however. The indigenous Bon people had their own native religion and objected strongly to the royal family 's obsession with what they viewed as a foreign religion. In 836 Lang Darma, who believed in Bon and objected to Buddhism, was installed as King. But as centuries went by Buddhism slowly gained in popularity until it became the predominant religion of the area. 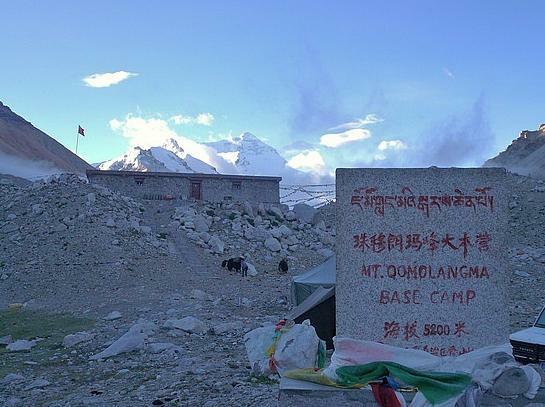 Now Tibet is the center of one of the world 's most famous Buddhist sects. After opening to tourism from abroad, the number of visitors from around the world has increased greatly. People want to get a view of this pure natural beauty for themselves. With deep traditions, colorful culture, spectacular beauty, and simple lifestyles, the area is great destination for those who enjoy visiting more rural and natural out of the way settings.